In a world filled with what often seemed like a constant barrage of bad news, sometimes you just want a light, carefree story to cleanse the palate, so to speak. Hero is a sweet, easy to read (or in this case, to listen to) story that takes you to a land where you just know, right from the start, that everything is going to work out okay. The main character in Hero is Saturday Woodcutter. She’s a rough and tumble sort who eschews all things feminine and dainty in favor of a good sword fight and plenty of hard work in the sun. Of course, in a family filled with strong personalities, even someone as brave and spirited as Saturday has a hard time standing out from the crowd. That all changes in an instant when crisis strikes. Saturday, feeling responsible for both losing her little brother and possibly causing the end of the world as we know, is forced out on her own in order to fix the mess. Hero is a rather short read, but it packs plenty of punch in terms of story line. For those new to the Books of Arilland series, it does a passable job of introducing readers to the characters without being so overly thorough that it becomes tedious for those who read the previous book. Saturday herself is a well fleshed out character, giving readers a really good handle on who she is as a person. Peregrine, Saturday’s eventual love interest, is a calm and measured sort, owing somewhat to his many years of captivity. This serves well as a foil for Saturday’s impulsiveness and quick temper. By the end of the book, readers are pulling for the unlikely duo to prevail over an evil witch, against all odds. 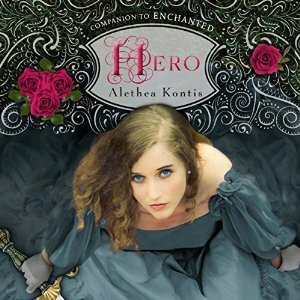 Hero is narrated by Katherine Kellgren, who also voices all of the characters in the book. Her voice is even and soothing, and she does a nice job of changing tone to differentiate between the characters without sounding ridiculous. Overall, Hero is a nice little adventure that will keep you guessing, without requiring too much from the reader. It’s a nice summer read that is family appropriate, making it a great choice for those long drives on your family vacation.